Who exactly is this ‘we’ who has been responsible for the extraordinary increase in production? Natural gas production on federal lands has decreased 16 percent since 2008. The gas production Obama is speaking about is on private and state lands. Production of gas on federal lands, where the administration wields the most power has been declining for a decade. In fact, in 2003 federal lands accounted for 35% of total U.S. natural gas production. Today they account for just 20%. This rebirth of the United States as a global leader in natural gas production is purely a result of the revolution in hydraulic fracturing and horizontal drilling and has taken place on non-federal lands. A decade ago shale gas accounted for zero of total gas produced in the U.S. This year shale and tight gas accounts for over half of the gas produced, again this is on non-federal lands. Lands where private individuals, and independent and major oil companies do business. The president is fortunate to have been in office during this revolution, but to use this as a talking point to seduce voters is in poor taste. This statement is akin to stating that there are more iPhones in the hands of everyday Americans than there were prior to his entering office. True, yes. This ‘we’ the president talks about are the men and women of the oil and gas industry, and the non-federal mineral rights owners who trade with them. In the case of oil production, there has been much made of the fiscal year [FY] 2010 to 2011 13% decline in oil volume produced on federal lands. What has not been pointed out is that during this same period, non-federal land production totals increased by 11%. From FY2007-FY2011 production on federal land has increased about one percent while production on non-federal lands has increased by over 15%. Furthermore, non-federal lands contribute about 70 percent of total U.S. oil production meaning that they are responsible for about 96% of the total oil production increases. Given the fact that this data comes straight from a recent congressional research paper, we assume the president knows this. Multi-billion dollar projects searching for oil and gas in thousands of feet of water take much time to come online. How much of current offshore production volumes result from Obama’s policies or come from those of prior administrations is debatable. Not up for debate is the fact that under this administration over 85% of the U.S. continental shelf is closed for oil and gas drilling. Leases have been cancelled, withdrawn both onshore and off, and the oil permit process now takes twice as long as the former 5-year average wait time. 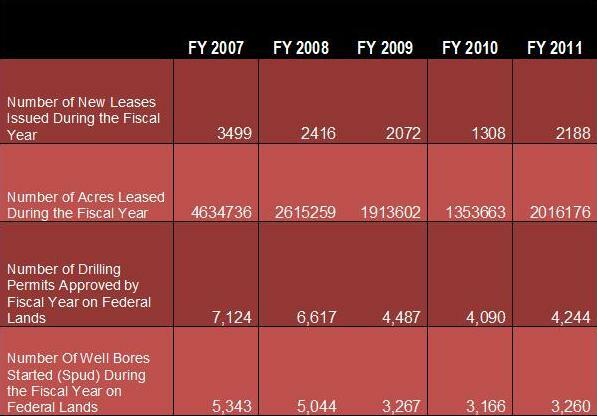 Below are the government numbers on federal leases, decide for yourself. According to the National Resource Council the pre-election lease sale offered by the administration was simply a recycling of leases offered last December. Meanwhile the energy renaissance has propelled states like North Dakota to produce three times 2008 totals, and over 6 times 2001 levels, resulting in state unemployment rates around 3%. The president’s contribution to this once in a lifetime event is that he supports the EPA’s attempt to usurp state and local regulatory bodies. He threatens the golden goose, yet takes credit for the egg. The Outer Continental Shelf Lands Acts states that the royalty rate (percentage of production paid to the government) be no less than 12.5% the value of production, with leases beginning in 2008 increasing to 18.75%. According to the Office of Natural Resource Revenue, total royalties, rents, bonus bids and other revenues collected from the oil and gas industry for development of Federal Offshore and Onshore lands was$9 billion. If the cut from Indian lands is included, this is increased to $10 billion. Add coal production to this list (another fossil fuel), and the total 2011 government take was $11,162,242,458 billion. Six billion of these dollars went straight to the U.S. treasury. The House Committee on Natural Resources states that Obama’s 2012-2107 lease plan offers the lowest amount of leases ever offered. If the administration truly wishes to increase production and wants more money from the oil industry, we suggest they do what they have refused to the past four years. Simply give producers permission to do what they do best-explore and develop. There is enormous opportunity on federal lands, if individuals of expertise and ambition are allowed to build. Let them.